This Sunday or Monday, Jews around the world celebrate the holiday of Purim. The traditional food is a filled, triangle-shaped cookie know n as hamantashen. You can use any cookie dough that is easy to roll and cut. I’d never made yeast hamantashen before, and I decided to experiment with sourdough. They came out okay, but I prefer a crisp dough that I always make. I’m a traditional kind of girl. . . 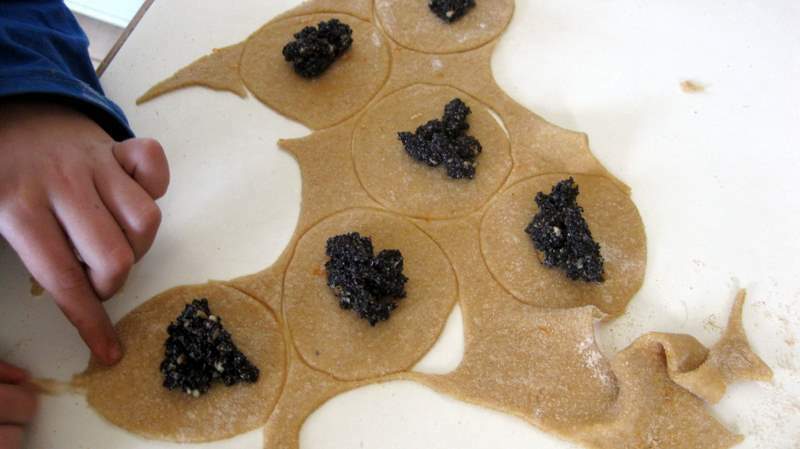 The filling pictured is also the traditional poppyseed. The recipe is 3/4 cup of ground poppy seed, juice of half a lemon, an egg yolk, lemon zest, and 1-2 tablespoons honey. You may need a little more egg to get the filling to stick together. You can grind poppy seeds in a coffee grinder. So far I prefer cookie dough hamantaschen too but I think that yeast dough might be more traditional. The yeast dough I used wasn’t sourdough. I was moderately rich and I think a richer, sweet dough might be the answer. I still think there should be a way to make wonderful yeast-dough hamantaschen. My favorite way to make poppy seed filling is to cook the ground seeds with milk and honey and to flavor it with grated orange zest. Is yours cooked, or are the ingredients simply mixed?